The department is monitoring CWD across the state. We take a look at taxidermist opportunities, we look at some of the deer processors, we get samples from deer, and we're looking on a general basis, 'is CWD out there on the landscape?' Where we find it, we take it very seriously. We do have some management plans on ways to keep it from spreading, to keep it localized, and that's something that the department takes pretty seriously. 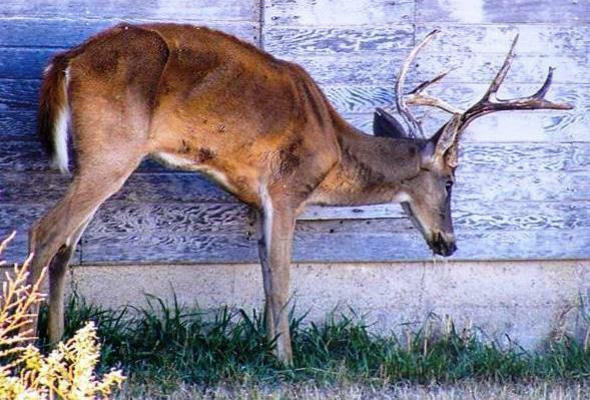 We've had an increase in the number of CWD cases in the last 10 years, and it's something that unfortunately has spread from North Missouri to other sections of the state. So, with that comes the burden of dealing with it, and that's something the department takes very seriously. Lindsey Grojean: I know one way you all are trying to tackle this, is with feeding restrictions. I know in June, Cape, Perry and Bollinger counties were added to a list of seven counties in the state for those new feeding restrictions. Are those going to continue after next year? They most likely will. At one time, feeding any kind of grain or finding a place to put some mineral salt licks was pretty important for helping to manage the deer herd. But now, the cost is much greater than the benefit. And that's something that we want to reduce: the opportunity for deer to come back to the exact same place and deposit saliva, which is one way that CWD can spread. So, if we reduce that opportunity, that means we have less likelihood the disease is going to spread. LG: Just for a little bit of back story for our listeners, could you tell me about chronic wasting disease and what all this entails? Chronic Wasting Disease was discovered in 1969, and it is an interesting disease from the standpoint that it is not a bacteria or a virus, or even a fungus. It is a protein that mishapes. So, once that protein is shaped improperly, it corrupts other proteins that are similar to it to unfold. And then these proteins don't do what they're designed to do. Unfortunately, the brain is made of a lot of protein in this instance. So, as the animal has more and more of their proteins unfolding, the function of the brain starts to deteriorate, and that begins to impact behavior and the body condition of the animal. And some of the symptoms you'll see: the animals don't react the way a wild deer should. They habituate around water quite a bit, they hang around, they drink a lot, they will even urinate in the water, which is spreading some of the prions. They're not fearful of people the way they should be, their body condition- they look very much out of shape. They look skinny, almost to the point their fur looks really bad. So they look in poor health all across the board. LG: So how does this affect humans? What risk does CWD pose to us, and why do we need to avoid it? Okay, right now beauty does not jump the species barrier as far as science has been able to tell us. And what that means is, CWD is very specific to deer, elk, moose, and even reindeer. There has been no instance of this jumping to any other group of vertebrates through the natural environment. They have even done some research projects where they've tried to, for example, get cattle to see if they would get it, and that has not taken place. They've taken some very aggressive measures and it still has not jumped that barrier between cervids into the bovines, which is your cattle. As far as human health is concerned, the Department of Conservation doesn't deal with that specifically, but the Centers for Disease Control has come out with this statement. They have said that if a deer tests positive for CWD, they do not recommend consuming that deer. They also recommend taking some common sense measures. When you're processing your deer, whether that means gutting it or processing it to put the meat away, wear gloves, and then wait to get it tested to see if it's negative. If it's negative for CWD, than certainly consume the meat. Overall, it's just some common sense. If there's a little bit of doubt lingering there, be smart. And that's what they're encouraging. LG: Other than to health, what other risks does CWD pose to Missourians? The real risk here is to the deer herd, and that may not sound like a real big deal, but you have to keep in mind that Missourians saw what did happen back in the 1930s when we almost lost our deer herd. They voted for a conservation agency to bring deer back: turkey, and a lot of other things. They wanted to see their forestry grown. They wanted to see their streams full of fish again. And so, they saw it's really not something we want to go back to. So, that's one issue, but the other part of it is that the deer herd is a real big deal economically, and I'm not talking about to the Missouri Department of Conservation. I'm talking about to Missouri. Deer hunting, If you look at all the things that deer hunting supports, it has a billion dollar influx of economic importance from the standpoint of jobs that it supports, the materials that hunters buy, the services they look for, like lodging or getting gas. Or, you know, the extra materials they use to go out and enjoy the hunt safely and securely. That's a big deal. That's a billion dollar influx of in Missouri's economy, and if we have something that threatens our deer herd, it also threatens the economy for everyone in the state, whether you deer hunt or not. LG: Why is an underpopulation an issue now? Okay, anytime you have a population, you want a proper balance: you don't want too many and you don't want too few. When you have too few, you have issues with genetics. For example: a bottleneck. Sometimes you have certain genetic issues that can become more prevalent in a smaller population. You want to have populations that are the appropriate size, so we don't want to see too few. We definitely don't want to see too many, because then you have difficulties with disease spreading more rapidly, you have more damage done by deer, there's more complaints, there's more vehicle incidents, and things of that nature. But, to an extent, those two- CWD and the population here in Cape- are kind of separate issues. But what they illustrate are extremes that we don't want to go to. We don't want to see CWD become something that is debilitating to our deer herd, to the point that we are like Wyoming, where they are about maybe 20 or 30 years away from losing their mule deer population completely. I also don't want to see us get to the point where deer become something that are viewed as a nuisance. A healthy population of deer is something that everyone can enjoy at some level, and it's minimized with regard to the difficulty of having complaints here and there, and it's something that most people enjoy. LG: You all have been hosting a series of open houses across... is it throughout Missouri that you all been hosting these? We have been doing these in counties where CWD is new on the landscape. For example: in northern Missouri, they have had CWD for the last 10 years, so the general communities up there are a little better informed. Now, down here, it's a brand new thing to some people- they have not heard of it. They don't know what it is. They don't know what the implications are. So part of what we're doing at these open houses is to tell people, 'Here's what CWD is, here's what we know about CWD, and then here's what we're gonna do about it,' because that's a very vital component of it. The Department of Conservation is not going to do nothing, because that will simply allow the disease to spread and become more common and prevalent. What we propose to do is: find out where CWD is, very specifically, on the landscape. Find out exactly where that deer was harvested, and then within that area, take about a five-mile radius, or maybe a little smaller than that. But, anyways, we're going to take a look at that and see if we can't reduce the deer density in that area. We're not removing all of the deer, we're just reducing the density so that deer interactions are much lower, so deer don't see other deer. And then, the one or two that might actually have an infection don't have as many deer to see to further infect. And that has been very effective in Illinois. They have been dealing with CWD for 15 years, and their prevalency rate in CWD areas has been down to 1 to 2 percent. Whereas, if you look at what happened in Wisconsin, which is right across the border from Illinois where they have not done as much, or they have been as aggressive in dealing with the issue, they see prevalency rates somewhere around 40 to 45 percent of their deer, and that's fairly high. So, Missouri has watched that, and we know which model we want to pursue. This is the best course of action. So, we want to inform people, 'Here's what we're doing, here's what we need your help on,' because it's not just the people in the agency; this is a hand-in-hand. We're working with the hunters, we're working with the landowners, and this really is the best thing to do to keep this disease from moving elsewhere within the county, and out of the county. LG: So, the MDC is asking for input from the public on some issues regarding CWD at these open houses. The department is considering some new regulations that would help us limit the spread of chronic wasting disease, and the way we go about that is something we want to make sure that the hunters, first of all, are informed on why we're asking. We're not just coming up with these things blindly; we have reasons for what we're doing. So we want the opportunity to share that with them, and then get feedback. Is there a better idea? How do you think that's going to work? What would be an issue in your mind? And just having that conversation may lead us to a much better product by the end of the the open house. So that's the whole thing: We want to share what we know, we want to get information on what they think, and we're going to try to come up with the best solution possible. LG: Well, how have how the past open houses gone so far? We had an open house here in Cape Girardeau a couple of weeks ago, and it was very well-received. We had about 60 people show up to that, and there was some very good conversation from people. Some people were very much in favor of, 'Hey, you need to do something and let's make it very strong.' Others were concerned about, 'What does this mean for me and how I hunt?' And how they manage their land. Those are some things that people do have some concerns over, so it was a good discussion. And, people don't have to come to the open house, necessarily, to express their opinion. It's a great place to learn and certainly be heard, and to talk to the people who are making those decisions and doing that research. But they can go online, and they can supply their input there without any difficulty. But it's a great place to be able to talk to somebody, get your questions answered, and learn all you can about CWD. LG: Thank you so much joining me today.